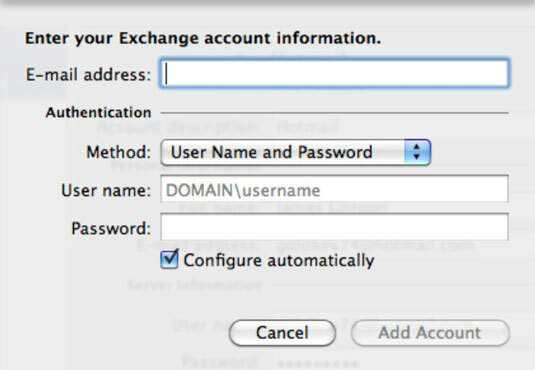 You manage accounts in Outlook 2011 for Mac within an Identity using the Account dialog. To activate the Account dialog, click Add Account on the welcome screen; or, in Outlook, choose Tools→Accounts from the menu bar. If you already have an e-mail account within an Identity, you can add more accounts, one at a time. The Account dialog lists your Identity’s accounts along the left. When you choose an account, the account’s settings display on the right. You can make the selected account the default account for the Identity by clicking the Set Default Account button. To add a new account, click the plus (+) sign, and to remove the selected account, click the minus (-) sign. In Outlook, choose Tools→Accounts from the menu bar. Click the plus (+) sign in the lower-left corner. Choose Exchange from the pop-up menu. Enter your e-mail address, username, and password in the aptly named text boxes. From the Method pop-up menu, choose User Name and Password. In most cases, entering these three pieces of information and choosing User Name and Password is all you need to do — Outlook does the rest. If you need to use Kerberos to connect to Exchange, click the Method pop-up button and choose Kerberos. Kerberos is an authentication protocol — don’t worry too much about this unless your system or the server administrator asks you to opt for this option. Immediately after connecting, Outlook synchronizes itself with the Exchange server bringing in all your mail, contacts, calendars, tasks, and notes.